Southern California-based roots reggae/dub band Stick Figure announces their Livin’ It Fall Tour, headlining for the first time and bringing chill vibes to fans coast to coast. 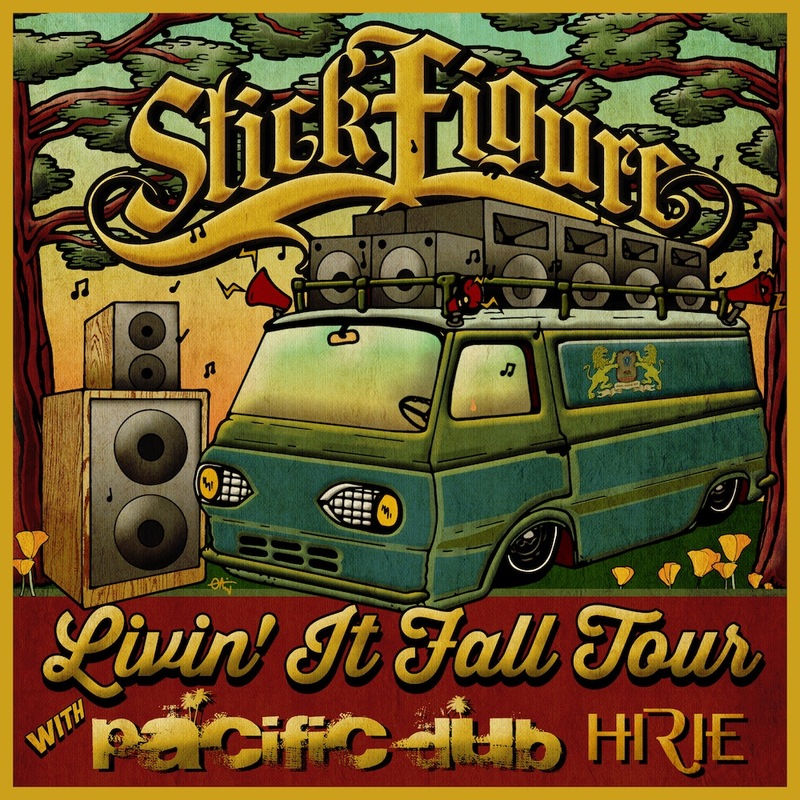 Featuring Pacific Dub and HIRIE, Stick Figure will be heading out this September, hitting stops like New Orleans, Washington DC, New York, Denver, and LA. The band’s most recent single for which they’re currently filming a video, “Smokin’ Love,” debuted at #1 on iTunes Reggae Chart on June 3rd and currently remains in the Top 10. On Soundcloud, the song has racked up over 550,000 spins. “Smokin’ Love” features reggae veteran Collie Buddz and is the first song they’ve released since 2012’s Burial Ground. Right now, Stick Figure and Rebelution are on their Count Me In Tour, which also includes Iration and The Green. Charming audiences and crushing amphitheaters, Stick Figure has immense stage presence and control, something that will translate well on the forthcoming Livin’ It Fall Tour. Please contact Michelle or Rory if interested in talking with Stick Figure. Southern California Roots Reggae favorites Stick Figure, are one of the few acts that are able to consistently reinvent themselves in the Reggae world. Stylistically unique, the band is able to build on their Reggae and Dub influences while creating a style completely their own. Multi-instrumentalist, producer and front man Scott Woodruff, fathered the group and is noted for his innovative style of recording; individually playing each instrument and multi-tracking them in unison. His touring band features Kevin Bong (Keyboards), Kevin Offitzer (Drums) and Tommy Suliman (Bass) and have played along side the likes of SOJA, Collie Buddz, Alpha Blondy and The Expendables. Having 5 full-length albums, selling over 50,000 albums worldwide and charting #1 on both the Reggae ITunes and Billboard charts the band shows no signs of stopping any time soon. Stick Figure kicks off the summer with the June 3rd release of “Smokin’ Love” a feel good anthem featuring Collie Buddz and will be hitting the road with Rebelution for their “Count Me In” tour, along side Reggae favorites Iration and The Green.